Well hello and welcome to my world. It's been a fair while since I last found the time to have a play in my craft room. What with working full time and a home to run, time is scarce. I really think working should be banned and crafting made essential. I don't know about you lovely people but craft time is something I need in my life in order to be truly happy within. Crafting is a way of expressing ourselves and the things that happen in our lives on a daily basis. Anyway I did find a little time to create this tag using the new Visible Image Stamps. I must be honest I was a little unsure of the Bloom and Grow stamp set. I felt I wanted to have a play with it, but at the same time felt it a little eerie but not sure why. Mark twisted my arm at the Ally Pally show saying go for it so here we are. This started out at a quick play with it and ended up here. Visible Image stamp set... Bloom and Grow. Visible Image stamp set ... How Fragile. Inkylicious stamp set... Water Drops. Marianne Designs stamp set... Eline's Brush. Tim Holtz Distress Ink... Faded Jeans. Tim Holtz Distress Ink... Broken China. Stamping Up Ink Pad... Night Of Navy. Verafine Ink pad... Onyx Black. 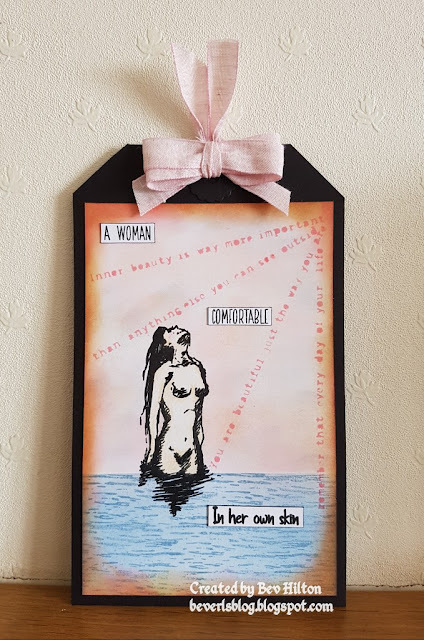 I began with a piece of plain white card and stamped the cracked image from the How Fragile stamp set in the middle of the card using the stamping up ink pad. Stamp the baby from the How Fragile stamp set using the versafine ink pad, I used a stamping platform so that I could stamp two or three impressions to ensure I got a solid image. Blend the broken china over the card, leaving it lighter in the middle. Once happy blend the Faded Jeans around the edge of the card gently until happy with the depth of colour. Take the Water Drops and stamp them around the card using the Stamping Up ink pad. 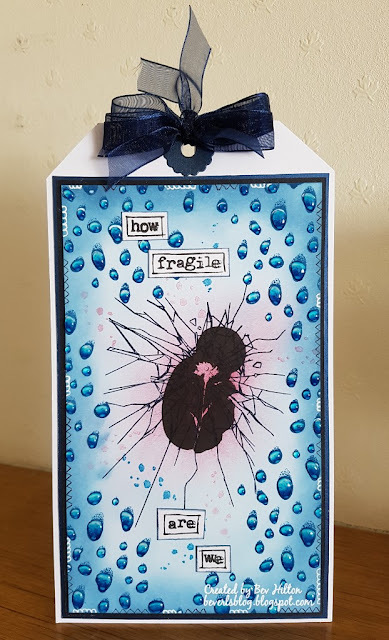 Use the white signo pen to add some highlights to the water drops and also a little doodling around the edge of the card. Using a black fine liner pen, add some more doodling around the edge of the card. I felt something else was needed around the baby so I took the small splodge stamp from the Marianne Design stamp set and stamped it randomly using the Cranberry Ink pad. I did this using second generation stamping so it was a softer impression. I also used this ink pad to lightly brush around the baby image. Take the words from the How Fragile stamp set and stamp them onto a spare piece of card and cut out. Glue the words onto the tag. To help the water drops stand out, carefully fill each droplet with the glossy accents and set aside to dry. I like to leave overnight to ensure completely dry. Mount the card onto black card, then onto a piece of dark blue pearl card, then onto a piece of white card, making sure you leave a longer piece at the top so that you have enough to cut the corners to create the tag. Punch a hole in the top of the tag for the ribbon. Using a die, cut two hole re-enforcement's in the blue card and glue in place over the holes. Create a bow using some blue ribbon and thread a piece through the hole. Glue the bow in place using a hot glue gun. I hope you like it. I certainly enjoyed making it, and despite nearly not buying this stamp set, I'm rather glad I did. I will definitely be having another play with it again soon. Thank you for stopping by and I wish you a happy weekend. I hope the sun shines for us all. Take care and happy crafting. So nice to see you on the blogging scene Bev and I have to agree we all need creativity in our lives to balance and make sense of everything else around us. Love your tag and it poignant words. That water drop stamp is my favourite inkylicious stamp set!! Hope you are keeping well? Wishing you a wonderful weekend.